Wedding Pianist for Essex, Cambridge and Surrounding Areas. Pianist for a Wedding Ceremony, Reception, Birthday or Anniversary. in Essex, Cambridge, Herts, Suffolk, Norfolk, London, and elsewhere in the UK. birthday party or a romantic evening or function playing any piano music from classical to jazz standards? CALL ME NOW (from mob phone)! Professional Pianist for your Wedding, Anniversary or function. 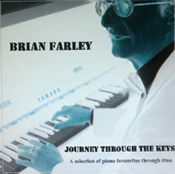 Brian Farley - the professional - experienced Pianist & Musical Director for "EVITA" and lots of West End and national touring musicals and the major cruise ships. I play all around the UK but provide the best quotes as pianist for hire for a wedding, special birthday, anniversary or function in my local Essex, Cambridge and Cambridgeshire, London, East Anglia and surrounding areas. Will play anything you want notified in advance or on the day. Reliable and very experienced worldwide. Fully professional digital piano and equipment available if required. Welcoming your guests with champagne whilst a cocktail pianist plays tasteful light music is always highly impressive. I have a repertoire of 1000's of well-known numbers as a wedding pianist and for a civil ceremony. Maybe dinner music is required from a professional pianist for a wedding reception or other special occasions, or piano music for a wedding anniversary or special birthday. Always check for availability if you have been let down by another pianist (which should never happen!). ANY Wedding, Anniversary or Special Birthday or Event in 2019 / 2020 needs checking NOW! *Especially URGENT for all Summer dates! Of course, in order to be one of the UK's leading pianists one has to have a high degree of professional experience in different styles and musical roles. I have been not only cocktail pianist on the P&O luxury cruise liners Canberra, Arcadia, Victoria and Oriana, but Musical Director for the production shows onboard as well. I was 1st keyboard and assistant Musical Director for 'Evita' over five years in the national tour, and been pianist and keyboard player for many other musicals and shows in London's West End, around the UK and abroad. You can check any date for my availability through 2019 or 2020 HERE. I have played on TV, accompanied a huge number of well-known artistes, performed as pianist at London's Hilton and Dorchester Hotels, made many recordings and I write and arrange music. I compose and create to commission or on the spot! I was trained at Trinity College of Music in London and play classical, folk, jazz standards, other standards, latin, show songs, pop and other genres - there are a few sound clips on this site. But enough....for more information you may wish to visit brianfarley.co.uk especially if you have a requirement for a musical director or need information regarding musical services not covered specifically by this site. As well as a pianist for a wedding, perhaps a pianist is needed for Valentines Day to play those sentimental love songs without intrusive vocals being in the way of the moment, or you would like to host an afternoon tea dance or musical quiz. A mothers day pianist who knows all the music of the era and is an adept professional at entertaining makes such a difference. Requests are encouraged - I won't be caught out very often on any musical numbers! Unlike many other sites on the net you will find, this is NOT an agency where you are unsure who will turn up as your pianist! 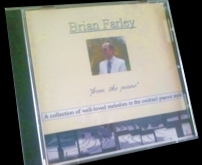 You are dealing direct with me, Brian Farley, a true worldwide professional pianist, and I will help you personally in a friendly manner with any details you would like to know about music choices, timings, normal event or wedding procedures, etc. using the benefit of my huge experience in the business. Please start by checking my availability for your date above. UK Functions: what areas are covered? In short, I can provide the perfect live solo piano music for wedding receptions, a wedding anniversary, garden party, corporate functions, etc. etc. I live on the Essex / Cambridgeshire border and I am for hire in Cambridge, East Anglia (which includes Norfolk, Suffolk and Cambs), Hertfordshire and London but of course perform as pianist outside of this area as well. More detailed list below. I supply digital piano &/or keyboards especially suitable for this professional work if required, but it is always nice to have an acoustic piano provided for the quality of touch and playability. The music sample clips have been recorded on the digital piano so you can hear the quality. CLICK HERE if a piano player is wanted for a wedding, anniversary or a birthday or you would like to organise solo pianist accompaniment for champagne, cocktails or dinner, etc. or a forthcoming Valentines or Mothers Day. Maybe a golf dinner, banquet or company dinner is approaching and you need music from a solo pianist for hire in Cambridge, Essex, Hertfordshire, Bedfordshire and surrounding areas. Musical Arrangements - If you need written musical arrangements, orchestrations or band charts for cruise ships, cabaret, etc. Visit Cadenza - resources for classical and contemporary musicians. www.musiccorner.co.uk - A site for all musicians from novice to professional and everything in-between. www.dhphotography.co.uk - David Hughes Photography and Video Services in Essex and East London. justessex.com - Search Engine for Just Essex. Matrimonials India - Indian matrimonial site offering matchmaking services for hindu, muslim, christian, sikh and other communities in India. UK Wedding Directory -Everything you'll ever need to make your wedding day really special. Easy Music Pieces - Easy music pieces, solos with recorded play along accompaniment. EZDuets - Easy duets and trios, sheet music for schools, music in education and students of a musical instrument. Wedding Trumpeter - Trumpet or trumpet/organ service for weddings, funerals and other functions. Children's Show Scripts - Children's Musical show scripts for schools. Put on an inspiring school show! Cellos and Violins For Sale - Cello and violin sales UK. Quality cellos for sale, violins and bows for sale and music publications in London. Restored old cellos fine-tuned by professional cellist. Stringed instruments sales from Zelia Ltd.
musicalinstrumentsales - Searching for secondhand musical instruments? - this site is the best in the UK. Massive site with around 400,000 hits per month! Pianist for Weddings in ESSEX. I am a local pianist to Chelmsford - Saffron Walden - Gosfield - Stock - Great Bardfield & Quendon. I play for weddings in Stansted - Great Dunmow - Margaret Roding - Braintree & Bocking. My local pianist areas include Castle Hedingham - Hatfield Broad Oak, Hatfield Heath, Manningtree & Brightlingsea. as are Chafford Hundred, Holland-on-Sea, Dovercourt, Clacton-on-Sea, South Benfleet and Colchester. Other areas in Essex served by my pianist services are Corringham, Basildon, Southend-on-Sea, Harwich, Frinton and Walton, Frinton-on-Sea, Grays, Walton-on-the-Naze, Hadleigh, Halstead, Flitch Green & Billericay. Kelvedon, Maldon, Tilbury, Rayleigh, Rochford, Ongar & Wivenhoe. Weddings, events in Burnham-on-Crouch, South Woodham Ferrers, Wickford, Jaywick & Epping. Pianist for Chigwell, Harlow, Stanford-le-Hope, West Mersea, Thaxted, Waltham Abbey and West Thurrock. Cambridge Wedding Pianist for CAMBRIDGESHIRE. Linton - my home village. Cambridge - my home city. I also am very close to Duxford, Castle Camps, Peterborough, St Ives, Fulbourn, Soham, Hanley Grange, Wisbech, Littleport & Ely. Nearby: Northstowe, Ramsey, Chatteris, St Neots, Godmanchester, Whittlesey, March, Trumpington, Sawston & Huntingdon. Pianist for Wedding in SUFFOLK venues: Newmarket, Felixstowe, Walton, Bury St Edmunds, Clare and Stowmarket. Pianist for Eye, Saxmundham, Framlingham, Beccles, Halesworth, Dommoc, Ipswich, Kesgrave, Lakenheath, Needham Market, Lowestoft and Mildenhall. Brandon - Bungay - Orford - Aldeburgh - Southwold - Hadleigh - Sudbury - Leiston & Woodbridge are all within my coverage as pianist for your wedding, birthday or function. Haverhill is 10 mins drive away! 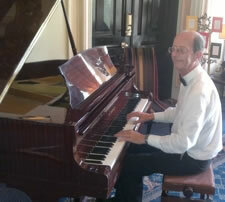 Herfordshire Wedding Pianist in HERTS. Areas served include Hoddesdon, Sawbridgeworth, Baldock, Letchworth, Knebworth and Welwyn. Also Bishop's Stortford, Stevenage, Broxbourne, Waltham Cross, Hertford, Cheshunt, Harpenden, Hatfield & Hemel Hempstead. Pianist for Rickmansworth - Hitchin - Ware - Bushey - Potters Bar - Cockfosters - Hadley Wood - Tring. Royston - Melbourne - St. Albans - Berkhamsted - South Oxhey - Spellbrook - Buntingford and Welwyn Garden City. I include Chorleywood, Apsley, Borehamwood and Watford. Pianist for wedding or birthday or function in BEDFORDSHIRE - Woburn, Leighton Buzzard, Bedford, Luton, Dunstable, Potton, Kempston, Flitwick, Biggleswade, Sandy or Ampthill. Pianist for LONDON - Central London, All London Suburbs and Heathrow. Pianist for Wedding in SURREY. Banstead, Englefield Green, Farnham, Caterham, Woking, Cobham, Reigate, Staines, Egham, Egham Hythe, Horley, Walton-on-Thames, Sunbury-on-Thames, Esher, Oxted, Farleigh, Whyteleafe, Gatton, Brookwood, Godalming, Haslemere, Hurst Green, Leatherhead, Dorking, Earlswood, Redhill, Ashford, Shepperton, Bellfields, Addlestone, Weybridge, Ewell, Camberley, Guildford, Lingfield, Gatwick, Epsom & Chertsey. Footnote: East Anglia includes Cambs, Norfolk and Suffolk. No part of this site or source may be copied or otherwise used without the express consent of pianist4u.co.uk. Copyright will be stringently enforced.